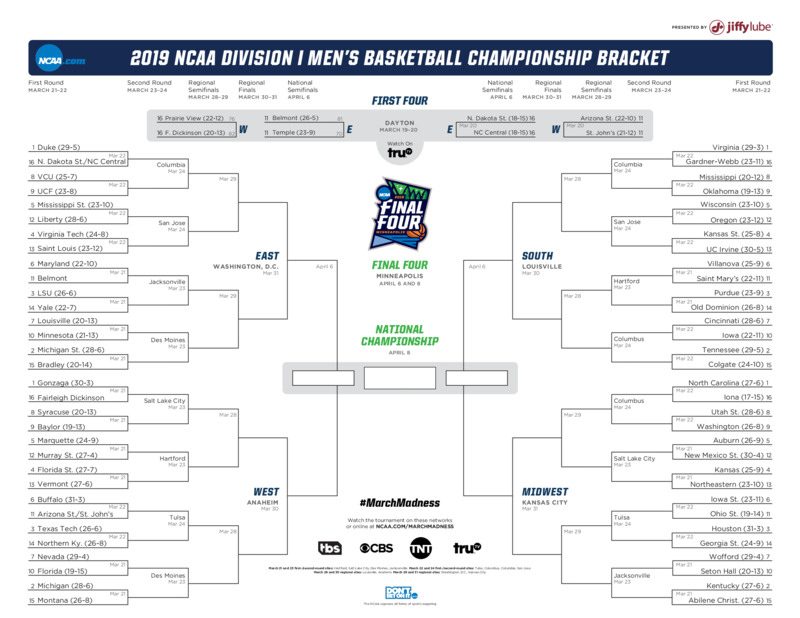 General Discussion about the 2019 NCAA Tournament. Don't think these predictions are gonna happen. Thoughts? not looking to toot my own horn, but who started the bracket challenge? ButlerNut, pappyball, kmacker69 and 2 others like this. I'm sure that typing this out will come back to haunt me, but I like Northeastern over Kansas and Oregon over Wisconsin. As good as Ja Morant is, I think Marquette has such a better overall team that Murray State won't be pulling the upset. The one upset that I really like is Georgia State over Houston. I think it should be a good game anyway. Talent advantage is heavily in Houston's favor, but the coaching advantage is heavily in Georgia State's, imo. butlerguy03 and pappyball like this. Old Dominion over Purdue is Edwards continues to shoot like cow dung. pjohnsto2003 and pappyball like this. SpartanDawgs and pappyball like this. to the tournament and i was able to attend most of Butler's games over the years, I just do not have that feeling this year. Hopefully I will have that feeling again sometime. This first game is fantastic. Damn it. Go Belmont. They are fun to watch. Play kinda like a team I used to watch. This is why God invented gambling. BulldogsFTW and pappyball like this. It's OSU so I don't care about sharing some things from the article (and I don't want to get scolded again). 1. Thought it was interesting that teams share scouting reports once the Tournament arrives. OSU and Iowa agreed to swap reports on Iowa State and Cincy. 2. Schrage called a recruit Sunday night and had Holtmann talk to him as they were preparing their scouting reports. Recruiting really never stops, does it?? Would have thought they'd be 100% focused on game planning. 3. I really, really wish we would have found a way to keep Terry Johnson on staff. 4. This line could be divisive - "Schrage is in his office as ESPN is rolling through the selections for this year’s NIT. Butler — where he, Johnson and Pedon worked for Holtmann two years ago — comes up and is going to play at Nebraska. Schrage excitedly yells out the matchup to anyone who can hear. " Was it "excitedly" in a douchey way because we made the NIT, or was it genuine reaction to us being able to continue our season? Who knows. 5. The descriptions of their offices and other facilities reinforce my opinion that I could never be upset that Holtmann left, it's how it happened. And it pained me that he took the whole damn staff. But don't think there are many coaches (besides Stevens, obviously for college jobs) who would turn down that kind of money and perks. I am completely wrong. I was more focused on just competing against Willis for the fun! I apologize! @estar20dawg started that challenge. pappyball, bwesson15 and estar20dawg like this. Congrats to Rick Byrd and Belmont, hope they beat Maryland and go a long way. DawgsMD and bumba like this. Ster8462 and pappyball like this.